On a Sunday evening on 21st August 1955, Billy Ray Taylor witnessed something in the sky emitting flames “all the colours of the rainbow” overhead the quiet farmhouse where he and his family were staying with friends, the Suttons. He followed the craft until it fell from the air a few hundred yards behind the farmhouse. 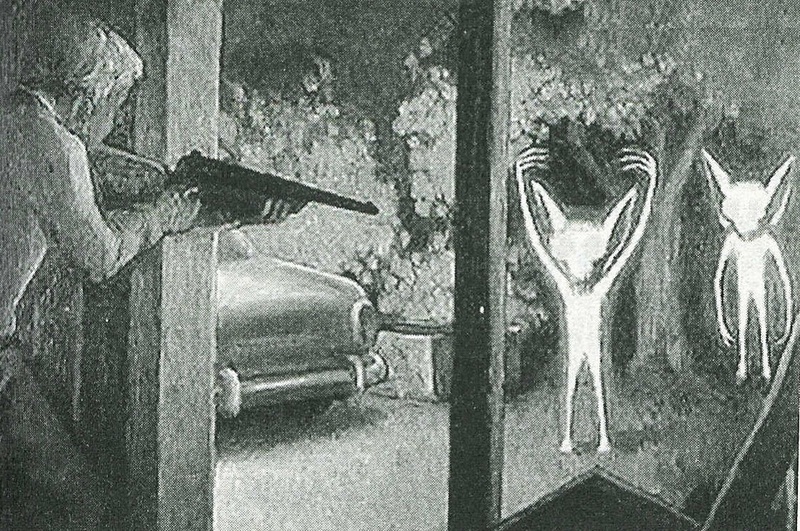 The incident that was about to unfold is commonly known as the “Kelly–Hopkinsville encounter” – although some refer to it as, The Kelly Green Men, The Hopkinsville Invasion or The Kentucky Goblins. The Sutton’s secluded farmhouse sat on the Old Madisonville Road, eight miles north of Hopkinsville and close to Kelly, each small towns in Kentucky in the United States. It was for all intents and purposes “cut off” from civilisations, with no telephone, no radio or television, nor even indoor plumbing. ​Startled by what he was seeing, Taylor quickly made his way back to the main house. He spent the next hour telling his family and the Suttons what he had seen, and was largely dismissed by the farmhouse’s other occupants. That was until the Sutton’s dog began to bark and become agitated outside. The Kelly-Hopkinsville Incident of 1955 was said to have seen two families attacked by "goblins" from outer space! Suddenly, as if it realised it was being watched, the creature brought its arms above its head and headed towards the farmhouse. This prompted both Sutton and Taylor to reach for their guns, and open fire. The creature was hit several times, but instead of dropping to the ground, it simply appeared to momentarily lose its balance from the force of the bullet, before it steadied itself and scarpered off. The families rushed back into the farmhouse. To their horror, they saw another creature appear at a side window of the property. Again the two men fired their weapons, and again the effect was the same. They later recalled hearing a “metallic” ping type of sound when the bullets found their target – as if the suit was some kind of protective clothing. Taylor ventured back outside to see if they had indeed killed the creature, and was grabbed at by a clawed “hand” – his family having to grab him and drag him back inside the property. More “glows” were seen from the trees, and what followed was a three hour “stand-off” between the two terrified families, and the strange glowing creatures that appeared to be surrounding the isolated farmhouse. ​About an hour before midnight, with the sightings seeming to have stopped, the families saw an opportunity to reach their cars. Once in them they drove as fast as they could to the nearest town of Hopkinsville. ​Once there they relayed their story to the police department, who, seeing how genuinely terrified the families were (eleven people in total), agreed to go and check out the farmhouse. So seriously did they seem to take it, that a military unit was also sent with them from Fort Campbell. Although they found evidence that some kind of disturbance had taken place, they did not come across the strange creatures. One officer stated he thought he saw something glowing but that he lost it in the woods. Calmed somewhat following the once over by the police and military unit, the families returned to the farmhouse shortly after 2am. However before the long the creatures were back, and several more hours of keeping them from house ensued. By daylight they suddenly disappeared without warning. ​Although there was not a trace of evidence of their visit left behind, locals state that the area where Taylor claimed he saw the strange craft fall to the ground featured a strange circular patch, where nothing would grow until the late 1960s. The following day the local newspaper, the “Kentucky New Era” reported the alleged events, leading to the farmhouse being bombarded by enthusiasts and UFO hunters over the years. 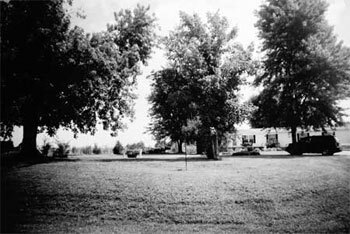 The Sutton family eventually sold the farm and moved away from the area. 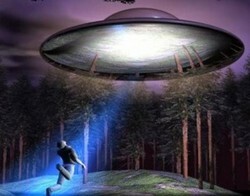 The incident remains one of the more well-known alleged alien encounters. You can check out the video at the bottom of this article in which Geraldine Sutton-Stith (who was a child on the night the events took place) talks in detail about it. In 2012 however, the website weekinwierd.com was sent correspondence that claimed the Kentucky Goblins creatures had come back, and this time there were photographs to prove it. 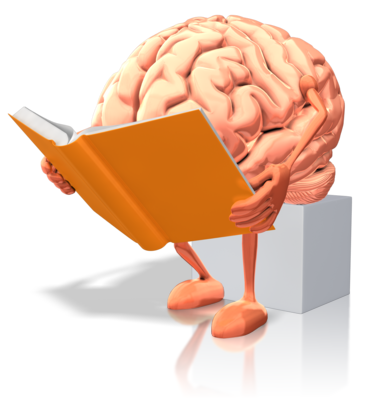 You can view those pictures and read that full account here (which is well worth reading), but here is a very condensed version of their theories and findings. ​They made the connection between these creatures and the mountains and tunnel networks that are said to genuinely exist under them – in particular the nearby Black Mountain in Kentucky and the more infamous Brown Mountain in North Carolina. Perhaps these creatures, if they had indeed crash landed in Kentucky that evening in 1955, had eventually sought refuse in the nearby mountain, a mountain whose underground networks could indeed lead to other mountains in the country, not least of which Brown Mountain. They also came to the conclusion that “someone” was aware of their investigations. You can check out some footage of one of their field trips out at Brown Mountain below and remember to check out the 2012 Kentucky Goblins article in full. 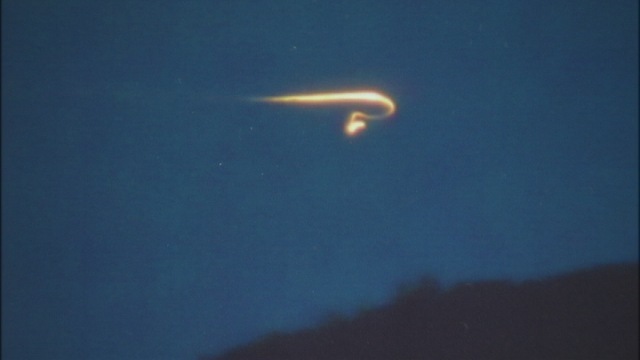 Brown Mountain has a long history of strange lights, orbs and unusual activity. More recently some have theorised that this mountain has an alien base within its ancient cavities. When Ralph Leal claimed he had found an alien mummy at Brown Mountain, this to some was proof of their theories. Leal had ventured to Brown Mountain in 1961 to see the infamous orbs for himself, and he wasn’t disappointed. He stated that an orb came right up to him and that he had a feeling that he was being “scanned” by it. He remained in front of it before the orb then moved away from him and into a cave at the base of the mountain. Leal followed it and entered the cave. Leal had several encounters in the caves at Brown Mountain, claiming that the orb was a “gas based lifeform from Venus” – you can read about his story in full here. ​He also discovered mummified remains of a humanoid figure, about three feet tall and with arms seemingly too big for its body. The orb apparently told him to remove the mummy as proof of his journey into the mountain. Could this have been the mummified remains of one of the creatures that landed in Kentucky years before? Or had it been here much longer? The only known picture of the mummy can be seen below. Is this the mummified body of an alien? Ralph eventually wrote the book “The Brown Mountain Lights” and never wavered from his version of his journeys into the mountain or how he came to be in possession of the alleged alien mummy. He also stated that he was regularly “harassed” by government agents who were “investigating” the Brown Mountain area. Perhaps more mysteriously was shortly after his death in 1978,the shop he owned (and where he is alleged to have kept the mummy) was bulldozed to the ground, with everything in it destroyed, including it would seem, the mummy itself which has not been seen since, and no-one seems to know its whereabouts. ​Brown Mountain isn’t on its own when it comes to multiple reports of mysterious lights and strange behaviour. Dominating the skyline in north California, Mount Shasta is one of the most mysterious and enchanted mountains in America. Numerous Native American tribes of the area believe it to be the point of creation, and believe it to be a very spiritual environment. The Grandma herself, named Kathy, might have dismissed the boy’s story entirely, but she herself had had a strange encounter in the woods the previous year while she and a friend were camping. They both awoke one morning, noticing they had a strange bite mark on the back of their necks. Both felt unwell and “emotionless” and the only memory each of them had of the night prior was of red eyes watching them from the woods. Maybe the most outrageous claim was that of a Los Angeles man, who claimed that he had become lost in the woods near Mount Shasta after he had tried to locate the whereabouts of a female voice that he could hear singing. He stated he was taken against his will to a secret chamber in a cave of the mountain, where a tall female figure gave to him “a gift” – he didn’t elaborate what the gift was, but has since claimed he is a Hindu god that has been reincarnated and that his name is, Lord Kalki! Numerous UFO sightings and claims of bright orbs or lights around the legendary mountain have been made over the years, and the first recorded sighting Great Airship sightings of 1896 and 1897 was in the immediate vicinity. There are conspiracy theories that claim Mount Shasta is in fact a top secret base that houses alien aircraft. In 2013 a video appeared on You Tube that claimed to show a UFO exited through a portal over the mountain. You can view that below and read in a little bit more detail on Mount Shasta here. Perhaps one of the more sinister mountains on the planet is sat on the other side of the world. Menacingly sat in Queensland, Australia, the appropriately named Black Mountain is not only steeped in legend and folklore, but has been the site of very real disappearances and strange phenomena. The mountain itself is comprised of hundreds of huge black pieces of granite – the result of magma solidifying around 250 million years ago. Against the backdrop of green that surrounds it, it certainly stands out to all that approach it. ​The Aborigines refer to the mountain as “Kalkajaka” – which essentially means “Mountain of Death!” Their legends states that it is home to evil spirits that crave both human souls and flesh. Animals are even said to be unnerved by it and for the most part avoid it. Some legends speak of “strange beasts” that call Black Mountain home ranging from a large cat called the “Queensland Tiger” to reports of reptilian humanoids. In more modern times there have been several disappearances on Black Mountain. The first recorded disappearance came in 1877 when a man rode to Black Mountain on his horse looking for a calf that was lost from his herd. Not the man, the horse or the calf were ever seen again. Perhaps one of the most famous disappearances was that of a criminal none as Sugarfoot Jack and his gang, who following a shootout sought sanctuary in Black Mountain in the 1880s. An extensive search was made for them, but none were heard of or seen again. The disappearances continue to this day. Aircraft pilots have also stated that they have experienced strange magnetic interference while flying over the sinister mountain. Of course, surprisingly or not, there are also extensive reports of strange lights and UFOs in the area. While most mountains are dripping in ancient legends and folklore, one of the strangest events regarding an equally strange mountain happened very recently in France. ​In the run up to the supposed “end of the world” in December 2012, the small village of Bugarach in France was invaded by those who believed that not only would the world end, but they would be saved by being within the vicinity of the mysterious mountain there. In the run up to the big event, many “believers” and even ufologists bought up land and properties nearby so that they were guaranteed a front row seat the events. You can read a little bit about that here. Sometimes referred to as the “upside down mountain”, the layout is unusual in that the older layers are the upper layers, which are millions of years older than those below. This is thought to be due to an explosion long ago which is thought to have caused the mountain top to flip over and then land upside down. This also incidentally, created a “flat” top to the mountain – which some eager UFO enthusiasts point out would be ideal for landing a craft. As well as strange geology, the mountain has an impressive list of legends and conspiracy theories alike surrounding it. Reports of strange lights and unidentified crafts are a regular occurrence, while others claim to have heard strange buzzing sounds or of seeing “white figures” observing them. Other theories state that there is a huge lake underneath the mountain that UFOs use as a base – although there has been no proof offered to support this particular theory. Legends state that the mountain was used by the people of Atlantis as an outpost, while others state that the lost continent of Lemuria sits underneath the mountain. This last particular theory is said to have inspired the story, “Journey to the Centre of the Earth” by Jules Verne following several trips he made to Bugarach. ​Remember to check out the video below regarding the Kelly-Hopkinsville incident.